Feb. 14, 2012 1:00 p.m.
Kwalikum’s Michaela Witte pushes the ball down court while Ballenas’ Magan Bell. Junior Girls basketball was up and running at Kwalikum Secondary School over the weekend, as eight teams took to the court for the Mid-Island District playdowns, and as expected, the tournament final was another battle between the host Kondors and the Whalers from Ballenas Secondary School. Kwalikum blasted Barsby 38-8 in their opener (Michaela Witte led the charge for KSS with 16 points), then roared back from an 11-4 first quarter deficit to beat the NDSS Islanders 40-32 (Nikki Krishka was top scorer with 14). BSS in the meantime clobbered Cedar 51-29 in their opener (Whaler standout Chelsea Hoey had 18 points and Brittany Britz added 10); then shredded the Wellington Wildcats 54-39 in game two (Hoey led the way with 26) to set the table for the all-local final which many had predicted. “Oh yeah, just as expected,” one b-ball dad chuckled at halftime. A hard-fought game from start to finish, the Whalers scored the first five points. The Kondors clawed back and led 9-8 after the first quarter and 17-10 after two. Ballenas battled back with a run in the third to take a 26-25 lead into the final quarter. KSS hung on for a thrilling 39-36 win and kept their unbeaten streak intact. Witte led the K-birds with 18 points. Krishka chipped in seven and earned extra props from her efforts on D.
“Very intense defence — smothering defence,” chuckled KSS principal and girls assistant coach Jesse Witte. Hoey led the Whalers with a game-high 21. The Kondors went into the tournament seeded No. 1 after finishing first in the 11-team league at 10-0, and Ballenas right behind in second at 9-1. The two teams had met twice before this year, KSS won both — one by one point, and the other by three. Not lost on those close to the game is that Witte, along with Kondor head coach Darin Carmichael and his Ballenas counterpart Daryl Britz, have all coached most of the girls on the court Saturday at some point over the years. 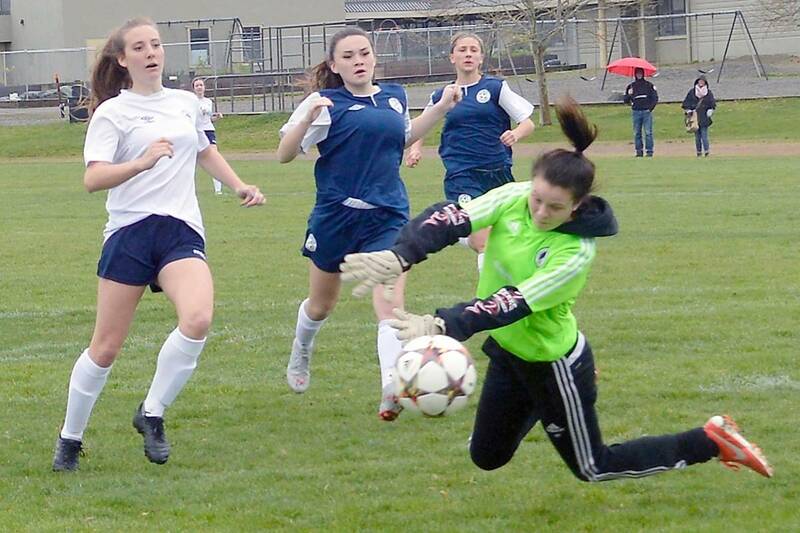 Usually it’s the top four teams out of the District finals that advance to the North Island championships (slated for Mark Isfeld in Courtenay this weekend), but this year the top five moved on as there are more junior girls teams up-Island. The top four teams out of the North advance to the Island championship. The Kondors open the North Islands on Thursday against the Dover Bay Dolphins, while Ballenas takes on the Towhees from GP Vanier.